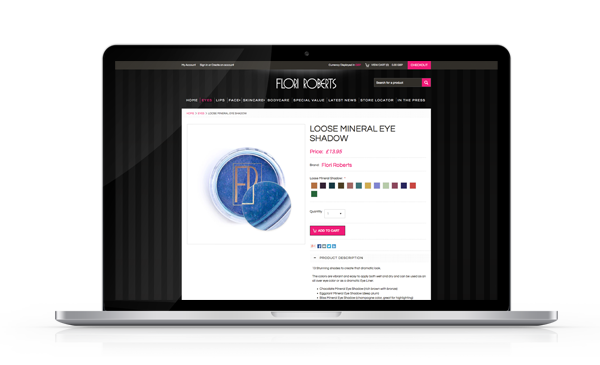 Flori Roberts UK are an online retailer for high-end cosmetics for women of color. Innocent approached Innovative as he was looking to create a new visually stunning website which would showcase his prestigious product lines to a wider audience. The project also required meticulously planned SEO and Ad-words Campaigns to increase brand exposure and garner a larger market share. After meeting with Innocent, we were able to quickly establish the website requirements and choose BigCommerce as our development platform. We produced designs which highlighted the superior quality of the product range and establish the best payment options available within budget. We also used our photographer to take all product and concept shots, enabling a truly bespoke look and feel. By using our own photographer we able to produce stunning product and concept photography which complimented the Flori Roberts brand whilst exceeding client expectations. BigCommerce features eBay shop integration, which allowed products to be listed on both platforms but all orders are managed centrally in the BigCommerce Admin. SEO was a factor in software choice, BigCommerce has an incredibly intuitive user interface and allows store administrator access to all relevant areas, allowing full SEO control. Worldpay© and PayPal© have pre-integrated secure payment modules on the BigCommerce platform, this saved a lot of time and money on the site development. Innovative Consultancy have provide us with a state of the art eCommerce website for our company that has raised the profile of our brand up there with the rest of the top Cosmetics companies. I really can not praise them enough for the work and the professional manner of their staff. Our website is beautifully designed and very user friendly. Innocent Mukarati. Managing Director Flori Roberts UK.